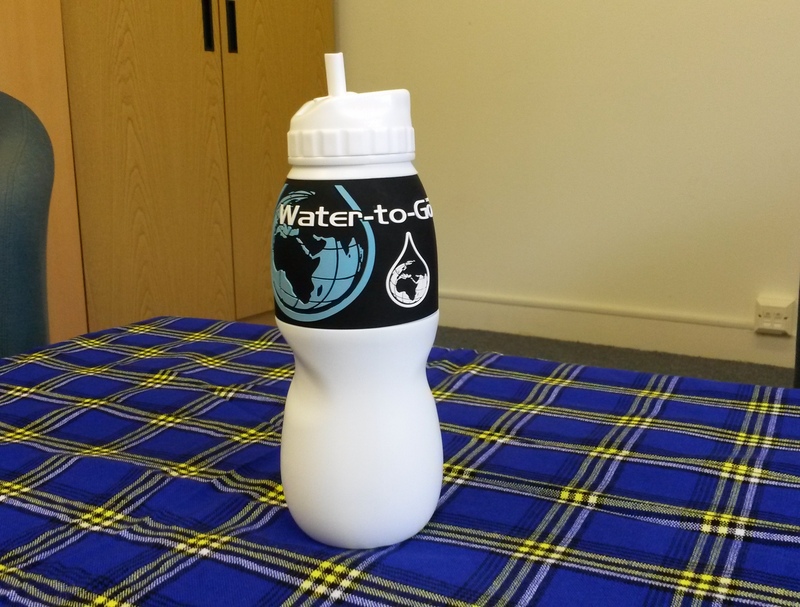 For my recent trip to Tanzania, our good friends at the Gap Year Travel Store sent me a new water bottle to test in Africa, the Water-to-Go bottle. It’s a sports bottle with a great added feature – a water filter in the cap which kills 99.9% of all known bacteria and bugs to provide safe, clean drinking water. The bottle can be filled with water from any source, apart from sea water, and it will taste great. See below for a video of the bottle in action! The filter uses technology that was developed for the NASA space programme. All you need to do is fill the bottle from your water source (tap, stream or even pond! ), screw on the cap with the built in filter, ensure the filter gets nice and wet, then drink normally as you would from a sports bottle. As you drink, the water passes through the filter which removes 99.9% of contaminants including chlorine, flourine, chromium, mercury, nickel, copper, iron, lead, gold and silver. All in all, it’s pretty clever stuff! The filter is good for up to 200 litres of water before it needs replacing (roughly 3 months). For people on a short trip with Oyster, 1 filter is more than sufficient. If you are going away for 2 months or more, I would suggest taking a couple of spares with you. Spare filters are available for approximately £15 for a twin pack. 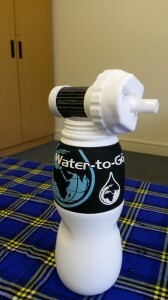 The Water-to-Go bottle offers an easier alternative to purification tablets and other water treatment methods. You can read more about the technology used on the website. I took the bottle with me to Tanzania and was looking forward to giving it a try. It turned out to be a great product that meant I didn’t have to buy loads of bottles of mineral water (recycling these bottles in Tanzania is not an option!). Right from start of my trip, when I had passed through security at Heathrow, the bottle came into it’s own. You cannot pass through security with water in the bottle but once through, I was ready to fill it up and put it to the test by filling it from the drinking water tap by the toilets – no more buying extortionately expensive bottles of water at the airport for me! Having spent many years briefing volunteers not to drink from the taps in Tanzania, filling up the bottle from the tap in my hotel for the first time felt a little strange. I wasn’t sure that I should trust it, what if the filter wasn’t screwed on properly? What if the seal wasn’t in place? Both these thoughts went through my head but as I tested the water through the mouthpiece, all I tasted was fresh clean water. Three weeks on, I can report that I’ve had no stomach problems, so I guess it worked! Even now I’m back home I’m still using the bottle. It fits snuggly into the drinks holder in my car and, even if the water has been left a couple of days, it still tastes fresh when you drink it. The one improvement I would suggest is to provide a cap for the mouthpiece. I found when I was in Tanzania, it was difficult to keep that part of the bottle clean, free from dust and dirt. When so much work has gone into making the water clean, I think a cap to keep the mouthpiece clean would be a good addition to this already great product. I think this piece of kit (retailing at £23.99) is going to become essential for any of our volunteers around the world. It is light, portable, long-lasting and it means you do not need to rely on expensive mineral water. If you’re really desperate you can even fill it from a muddy puddle or pond and still get clean drinking water! The Water-to-Go bottle is available through our recommended kit supplier – Gap Year Travel Store and retails at £23.99. The bottle is supplied with one filter. Remember that Oyster participants get a 10% discount on all orders from this website. If you haven’t received your discount code, contact me ([email protected]). Check out the video of it being filled up from a reservoir!